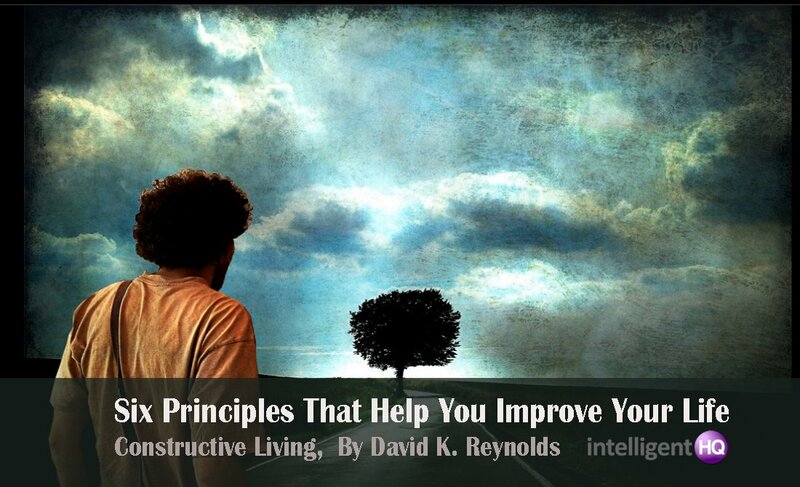 Constructive Living by David K. Reynolds, is one the few books that I keep by my bedside. Why ? Basically I go back to the book recurrently as I think its information is very practical and quite sharp. The book´s central argument is that we should focus more on controlling our behaviours and not our feelings. David K. Reynolds is a College professor and therapist. The theories he describes in his book are based on two Japanese psychotherapies, the Morita therapy and Naikan therapy, both influenced by Buddhism. Fundamentally, the book tries to give us, readers, tools to deal well with reality. One of the things the book stresses is to accept the reality around and inside us in the present moment. But that doesn´t mean that we should move through life passively. Actually, the book recommends that we act in a very practical way. The first principle explains why feelings are not directly controllable. In other words, we cannot control with our mind the way we feel. Obviously, this doesn’t mean that we cannot influence the way we feel (whatever the feeling is: rage, anxiety, sadness…) and actually thoughts crossing our mind do influence feelings. But attempting to change how we feel just by rationalizing our feelings is not a good idea. When it comes to feelings, if deep inside we don’t want to change something, the situation won’t change. Dr. Reynolds claims that the acknowledgment that we cannot directly control our feelings has a clear benefit. If we can control our feelings we shouldn’t consider ourselves morally responsible for whatever feeling we have. The second principle draws from the first one. It states that “feelings must be identified and accepted the way they are”. If we agree that we don’t directly control our feelings (through our willpower or our mind), we also can’t have any guilt in what we feel. Hence, accepting them would be a good first step. What would be even better is learning from them. Want to know how? David K. Reynolds asserts that recurrent feelings are originated by specific situations. A good strategy to avoid certain feelings could be to change the situation that triggers them. Well, I must agree with the author. It isn´t always possible to change the situation. However, if we can change the situation the feelings will follow. According to Reynolds, the third principle is connected to the second one. It states that every feeling can be useful. For example, fear can makes us move away from a certain threat (like an aggression or a car trying to run us over). But Reynolds also warns that not all feelings can bring good changes. However, all feelings have the potential to trigger positive actions. I confess that I have a hard time with the principle that tells us that all feelings can be useful. To understand that all feelings have the potential to trigger positive actions is beneficial though, because I try to find those potential actions, which can lead me to a better outcome. The fourth principle is: feelings go away with time, unless you keep feeding them. Even though we might feel overwhelmed by grief, fear or shock, with time such strong feelings lose their intensity and slowly become transformed into memories. Obviously, this also happens to feelings like happiness and love unless, according to Reynolds, one doesn’t keep stimulating them. Fifth principle: feelings can indirectly be influenced by our behavior. This means that behavior can accentuate the feelings we desire to have, but also that the way we behave can help unwanted feelings to disappear faster. Basically, we have to take smart actions in relations to our feeling. Stating the obvious, if we are feeling down probably it is wiser to do stuff like walk under the sun or be with friends then to be alone in your apartment. 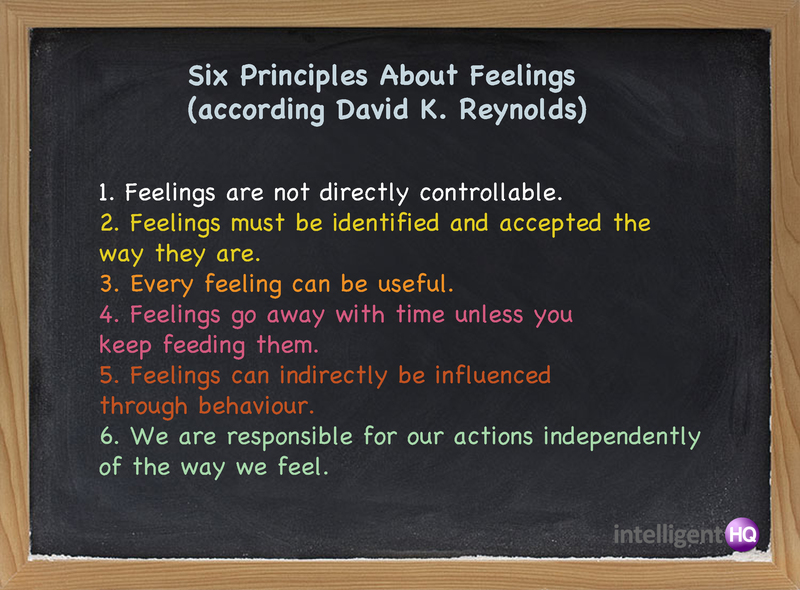 Reynolds sixth and last principle (less pleasant for us to hear) is that we are responsible for our actions independently of the way we feel. In most cases we can control our actions and leave our feelings on the side, however, as Reynolds states, the way we deal with our actions can offer us an emotionally rich life. I don´t think this book has the most original ideas as in a certain way we can find them in many other books. However, it is a very useful book that is well-written. I believe it will help you to improve the way you deal with reality and your feelings.